Affenpinscher puppies and dogs by nature are highly quick-witted and inquisitive making them both playful and mischievous. They love to entertain, enjoy being with their family and will get along well with other pets that they have been raised with. Although Affenpinschers are affectionate and amusing, they are not recommended for young children. This breed has a tendency to become aggressive toward anyone or anything perceived as a threat, particularly when it comes to their tendency of guarding and protecting their food and toys. 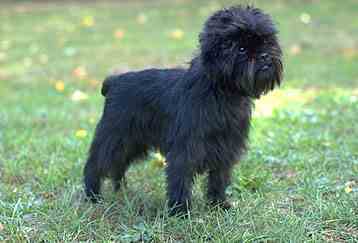 Affenpinscher puppies and dogs do not require extensive grooming. To avoid ruining their harsh coat, it must never be clipped short and should be brushed or combed weekly with plucking done as needed. Pay close attention to stray hairs that may grow in the corners of their eyes causing irritation. These should be removed immediately. Affenpinscher dogs are prone to open fontanel, slipped stifle and respiratory problems making regular vet check-ups a good idea. As a very hardy and typically healthy dog breed, the Affenpinscher dog has few major health problems or genetic concerns. There is the possibility of patellar luxation, or slipped kneecap, as the dogs age as it is most common with small breeds of dogs. This can be treated by a veterinarian. Young dogs could become diagnosed with the hip degenerating disease of Legg Perthes, which can usually be treated by surgical procedures. Ensuring Affenpinscher puppies come from reputable breeders who have previously screened the male and female parents for this genetic condition will help prevent this condition. More infrequently, this breed can exhibit improper closing of the bones of the skull, known as open fontanel, or a heart condition called PDA (Patent ductus arteriosis). Affenspinscher puppies and dogs should have regular exercise and receive positive training to prevent undesirable behavior that results from a surplus of unspent energy. Affenpinscher dogs should have routine outings such as daily walks. This exercise will reduce the likelihood of the breed becoming rambunctious in the house or prone to getting into things, as well as minimize unwanted problem barking or chewing. Affenpinscher puppies and dogs are quick to learn complex tricks and routines, and rather enjoy a challenge. This breed is very easy to train but does require a constantly changing routine to prevent boredom and non-compliance. Affenpinscher dogs should always be around people more than being left alone since this breed does not do well when left alone for extended periods of time.